When pursuing points and miles using credit card sign-up bonuses, you soon accumulate a lot of credit cards. I was accustomed to carrying multiple cards before I became immersed in these rewards, but the number of cards I currently hold has tripled. As an early-year task, I decided to undertake a top-to-bottom review of my open accounts in order to decide if any should be closed. There are more than a few credit card products on the market that I would like to obtain, so I want to strategize how to adjust my card portfolio in 2018. In a series of posts, I will review the cards I hold from various issuers and decide if it's time to close any. Part of my review will assess how an existing card combines with any new cards I am considering. Because potential cards can impact a keep-or-cancel decision, I will mention relevant products that are on my radar, but I will postpone a full analysis until I am ready to adjust my collection. Previously, I provided background to frame my analyses and reviews of my suite of American Express and Chase cards. Today, I want to look at my outstanding Citibank cards. One Mile at a Time has another post that does a good job of running through various scenarios with Citi cards. Both posts are recommended reading for familiarizing yourself with Citi's rules. Let's take a look at the benefits of these cards and the value I receive from each in order to decide whether to keep or cancel any of them. Effectively, if you pay off your card balance in full - something you should be doing! - you earn 2% cash back. That is better than either of the Chase Freedom products. Unfortunately, Citi does not pay its cash back as ThankYou points or this would be a great default card. While 2% is a great return for someone who wants cash-back, I prefer to earn points and miles so I never use this card. The Citi Double Cash Credit Card is my oldest credit card account, though it has been many products over the years. It began life as a standard student Citibank card, later converted to two different products offering car rebates, then the ThankYou Preferred Card. Last year, Citi offered to convert it to the Double Cash card. Since I was not using the card for ThankYou points due to having both the ThankYou Premier and Prestige cards and because I read some good reviews on the Double Cash card’s value for cash-back, I agreed to the conversion, though I have literally not used it once since that time. However, as my oldest account and one that does not carry an annual fee, I won’t be closing it. This is not due to nostalgia, but rather, as discussed in the background post in this series, a card of this vintage favorably impacts my credit score. The card has a $450 annual fee plus $50 for each additional user. Despite the high annual fee, this is a card that has more than paid for itself almost every year I have had it. The first year, I earned the signup bonus worth $800 and used both the $250 airline credit and the Global Entry credit of $100. Last year, in addition to the airline credit, I used the Fourth Night free on my wedding trip to Key West for total statement credits of $669. For this year, I intend to use the Fourth Night free again this summer in Paris which, combined with the airfare credit, more than cover this year’s annual fee. While I have shifted my focus to accumulating Amex Membership Reward and Chase Ultimate Rewards points, so long as this card continues to at least pay for itself, I see no reason to cancel it. 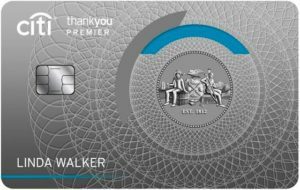 The Citi ThankYou Premier Card is similar to the Prestige card but lacks some of the premium features as well as the premium annual fee. The card carries a $95 annual fee. I obtained this card primarily for the signup bonus of 60,000 ThankYou points at the time. The triple ThankYou points on gas purchases was also appealing, though, the American Express EveryDay Preferred card, with its monthly 50% bonus, also pays 3x points for gas. Because I prefer Membership Reward points to ThankYou points, the attractiveness of this benefit is significantly diminished. Triple points on entertainment is attractive, but my annual spend in this category is not sufficient to justify the $95 annual fee. New applications for the ThankYou Premier card are offered a sign-up bonus of 50,000 points after spending $4,000 within three months of opening the account. Theoretically, I am eligible for this bonus since I have not opened or closed a card of this type in the last 24 months. However, an approval for the second ThankYou Premier card is far from assured. In addition, opening a new account for this card product would negatively impact my 5/24 status with Chase just as I am looking to shift that portfolio. My best option is most likely to close this account and reapply for whatever ThankYou product is offering a sign-up bonus two years from now. In the interim, I could focus on the many new and interesting card products on the market and hope Citi does not institute its own 5/24 rule. Assuming I decide to close the account, I may wait until I finish changing my Chase holdings so that I don’t reduce my total overall available credit. Such a reduction would increase my utilization rate and reduce my credit score. My renewal date is not until September, so I have some time to sort this out. Just as I get value from the my Delta Amex card , an American flyer would benefit from holding this card. However, I rarely fly American since I live in Atlanta and am primarily loyal to Delta, so the travel benefits of the card do not justify the annual fee. Also, even if I did fly American, I could get better points-earning, e.g., triple points on travel with my Chase Ink Business Preferred, when buying airfare. Though I have little use of this card now that I have earned the bonus, it would be bad form to cancel only seven months after opening the account, so I need to keep this account open until this fall. Adjusting my Citi portfolio is much more straightforward than my Chase portfolio, primarily because there are no Citi products that I am anxious to obtain. The biggest motivator here, aside from avoiding annual fees that don’t recover themselves in value from the card, is setting myself up for future Citi sign-up bonuses. That is a reason I will likely close the Citi ThankYou Premier card in the near future and start the 24-month countdown to renewed eligibility for the sign-up bonus. I will wait to do this until after I adjust my Chase portfolio and hopefully successfully apply for the Chase Sapphire Reserve card. The additional credit limit from adding a Chase account would offset closing the the Citi ThankYou Premier and minimize any decline in my credit score. Regardless of the moves I make with Citi, I want to be sure to not run afoul of the Chase 5/24 rule until after I adjust my Chase portfolio. For now, there is just one next step with Citibank: cancel my Citi ThankYou Premier Card pending Chase card changes. Later this fall, I will close the CitiBusiness AAdvantage Mastercard.